Summer has come and gone; it’s time to buckle down and get busy with a fall letterpress workshop. 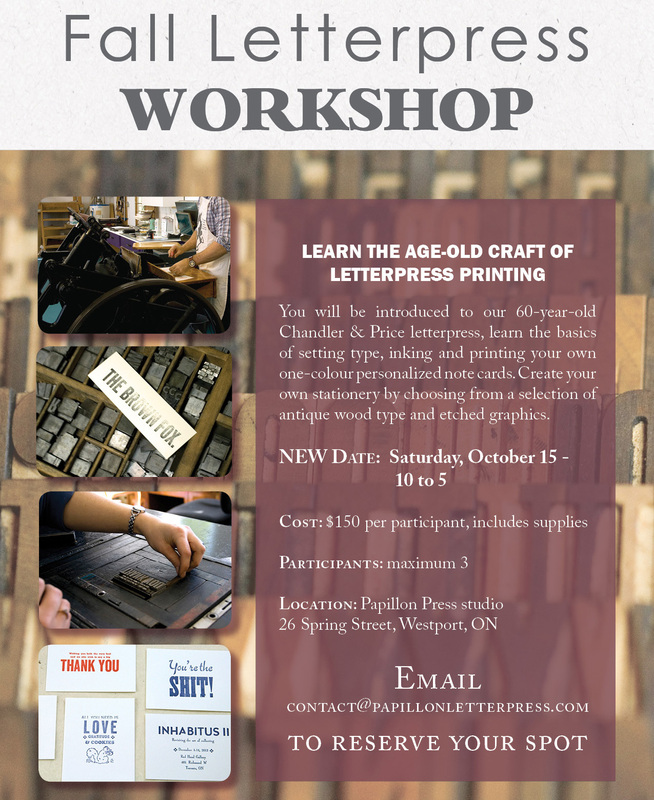 If you’re in the Ottawa valley or in nearby Ottawa or Kingston, come out for a day and learn how to set type the old fashion way and print your own personalised note cards. -access to our 110 cases of type (possibly the most type in Ontario aside from Upper Canada Village) and our vintage cuts (etched graphics). – You will be walking way with at least 50 A2 (4×5.25″) flat letterpress note cards, a value of $100. 11am-noon The rest of the morning is devoted to learning how to compose type in a composing stick, choosing from over 110 cases of type including lead type and wood type and from our dozens of cuts (pictorial etchings mounted on wood). noon-1pm Break for lunch. Westport has several nice cafés that serve tasty lunches. 1pm-3pm– Work on composing your type, then learn how to mount the type in the chase using furniture, leading & slugs. Each participant will proof their project on our proofing press to ensure there are no errors before printing on the big press. 3pm-5pm Each participant will learn how to mount the chase containing their type on our floor model 10×15 Chandler & Price letterpress and take their turn printing 50 pieces of their own project on a variety of paper stocks. If you have a special project you would like to print, please discuss it with us first and we will try to accommodate you. The price may vary depending on the project. Workshops take place in our studio at 26 Spring Street in Westport, ON.